Despite its small size, the Comag SL30 HDMI USB digital TV receiver can't be powered directly from a camping-friendly low-voltage DC source. You can record TV and radio programmes and timeshift using a rear-connected USB storage device. Also unusual at this price is the HDMI port; however, a Scart socket is provided as an analogue alternative. No UHF modulator is fitted. Also on the rear panel you'll find the LNB input and loopthrough output, which are perhaps a little too close together for comfort. An HDMI output (there's no upscaling) is accompanied by a composite-only Scart. The USB port can be used for firmware upgrades as well as recording. There's only space for a single power LED and the bare minimum of controls – channel up/down and standby – meaning that the handset is practically essential. The latter sports a vast array of buttons for PVR functionality, channel selection, menu control, teletext, subtitles, radio mode and much more. The receiver's internal construction is neat, though it can get quite warm in use. The second option of the main menu covers installation. After selecting the satellite(s) available to you in a list – the preset 44-strong list can be appended to or edited – the choice is made between fixed and motorised dish. If you're using the latter, the next menu (antenna setup) makes provision for USALS or DiSEqC 1.2 configuration, such as limit setting and satellite positions. Fixed-dish users, meanwhile, can specify a DiSEqC 1.0 port. Signal strength and quality bars indicate how the currently selected transponder is being received. A 12V switch item is redundant, given that there's no output. 'Single satellite search' does as it says; similarly, the multi-satellite search function available to DiSEqC systems will visit several satellites in one go. In both cases either FTA or all channels can be found, which is more useful than it seems because some channels are improperly 'flagged'. You can also scan for radio and/or TV. Blind-scan isn't an option; it's possible, though, to select an individual transponder and search that. No control over PIDs or FEC is, alas, offered. The transponder list can be edited or added to; parameters here are restricted to frequency, polarity and symbol rate. Other menu options look after the video-output settings, parental locks, clock, favourites (eight lists) and channel management. From here, channels can be deleted, locked, moved and skipped. They can also be sorted alphabetically or according to encryption status, and satellite-specific lists selected. This is just as well because the 'normal' channel list, accessed with the 'enter' button, gives you no such flexibility. At best, multi-sat viewers can toggle between the current satellite and all channels. Other menus look after recording functions, such as drive formatting and timeshift buffer duration. Compensating for the standard channel list's inflexibility is the 'find' button, which homes in on a channel if one or more letters of its name are entered. The basic but serviceable EPG can program the eight-event timer to instigate a USB recording or a simple channel change. Other features include a sleep timer, teletext, subtitles and soundtrack selection, video format and a TV/radio mode button. There's also a nine-channel, multi-picture thumbnail feature. Timeshifting, which needs to be turned on via a menu, requires an HDD – solid-state drives are not fast enough. Yet even with one of these slower devices you can play any recording (timed or manually-invoked) that's in progress – you'll find it, with any others, in the 'record manager' menu. We also discovered that you can simultaneously watch and record two different channels, although both must be on the same transponder. JPEG or BMP still images, MPEG video files and MP3 tracks will play too, although other content like DivX is ignored. You also get three games to play – Tetris, Othello and Sudoku. Pictures via Scart are disappointing. Thanks to the composite-only connection, they're somewhat fuzzy and spoilt by more noise than is usual. But audio quality is excellent. Fortunately, HDMI redresses the balance with a noticeably superior performance. Colours and greyscale are true to life and, within the restrictions of SD broadcasting, details are pleasingly resolved. Searches and channel-changing are both speedy, and menus are responsive too. However, sensitivity was found a bit wanting – transponders on some satellites were missed. Reception of Hot Bird and both key Astra clusters was reliable, though. We managed to run out of memory during a multi-satellite scan. 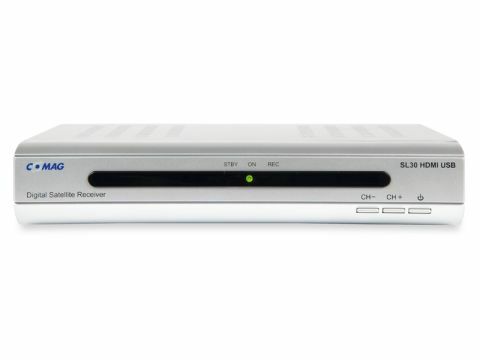 Although this receiver may boast DiSEqC capabilities, chances are that it will be partnered with a fixed dish in a budget setup and so this need not be an issue. Another problem we encountered relates to timed USB recordings. On seemingly random occasions the recording was not made – insufficient USB capacity was not the cause. Manually invoked recordings were always successful.